We arrived in Punta Arenas on a cruise ship stop. From the time I started inquiring about a private tour for 17 to our arrival today Maritza was wonderful to communicate with (excellent English as well) and everything went according to plan. The drive was beautiful with some wildlife and scenery stops. We even by chance witnessed a gaucho herding 3000 sheep. The Estancias visit was fun and lunch was good including my first pisco sour. Every person in our group concluded that they had a great day. Maritza is a pro, very experienced, very engaging, great sense of humor, and very accommodating. TOUR GUIDE RESPONSE: Thank you so nuch! Excellent. One of the best. TOUR GUIDE RESPONSE: Thank you so much! My kind regards from Punta Arenas. We had a very good time with Maritza. The vehicle she used was very roomy and comfortable. She is very thoughtful and knowledgeable, and very accommodating to our needs. I highly recommend Maritza. Like having a friend show the town and areas she loves. Fun and informative. TOUR GUIDE RESPONSE: That is the best feedback ever! Thank you so much. Maritza was the best! She was on time, extremely informative, very flexible and with a charming and warm personality. We could not have been more pleased! Nothing beats seeing King Penguins in the wild. Getting there from Punta Arenas is a very long journey, so mentally brace yourself, but, it is totally worth it. Maritza was incredibly accommodating and really made the trip. She is so knowledgable and informed us about local history, as well as info on local flora and fauna, all a long the way. Her upbeat attitude, engaging conversation, and dedication to helping us have the best experience is commendable. Highly recommend Maritza and this tour!!! AMAZING! Maritza is hands down the best guide we have ever had traveling. We had a flight issue which forced us to lose a day of our planned trip, but Maritza helped us to still get the most of everything Torres del Paine had to offer. She is so incredibly kind, flexible, smart, fun, outgoing, knowledgeable, and helpful. I strongly suggest travelers to do this tour and spend a few days in Patagonia over a one day option. I highly recommend Maritza and this tour for everyone! Maritza's tour was a great introduction to Punta Arenas. While the boat trip to see the penguins was the highlight of the tour, we also delighted in visits to the beautiful town square, the cemetery and especially to the Nao Victoria Museum with the replica of the first ship to circumnavigate the globe as well as replicas of other historical ships. Maritza did a wonderful joy and we highly recommend her tour. Maritza was a great tour guide. As I was preparing to book this excursion, she was willing to answer all my questions in a quick and timely manner. Once she picked us up, she gave us a great tour of the Punta Arenas and told us lots about the city. She explained everything about the day and so we were well prepared. We wanted to purchase some very specific items and Maritza helped us to find them. TOUR GUIDE RESPONSE: That is great! Thanks a lot. Thanks much to Maritza! Super job arranging our tour and You made our group trip unforgettable! Boat ride to Magdalena Island was a wonderful trip. Time we spend in the Penguin colony was unusual experience that we will never forget. Tour guide Jaime was a very knowledge of history and architecture of Punta Arenas which served to enhance our experience and appreciation of Punta Arenas. We highly recommend this tour and Maritza!! Three of us had a very enjoyable tour of Torres del Paine through ToursByLocals. We had an excellent guide in Maritza A. Maritza is extremely knowledgeable of Torres del Paine (TDP) - its landscape, history and local traditions. She entertained us with anecdotes and well-researched commentaries. She showed us the best of TDP effectively and efficiently. She is flexible with her hours and very serviced oriented. As a consequence, we had two fun days at TDP. Thanks Maritza. Our tour guide was fantastic! I have spent the last ten minutes trying to give her five stars, but the site does not work so well. I hope they will fix it because she deserves five stars and more! She was so personable and knowledgeable! Clean and new van that was more than enough space for the five of us. She also was very accommodating as we had special needs with the children. It was a wonderful day! We highly recommend her!!!! TOUR GUIDE RESPONSE: Thank you all! Very courteous,knowledgeable & was always on time. TOUR GUIDE RESPONSE: We had a fabulous time as well thank you very much. I did enjoy your sense of humor:). 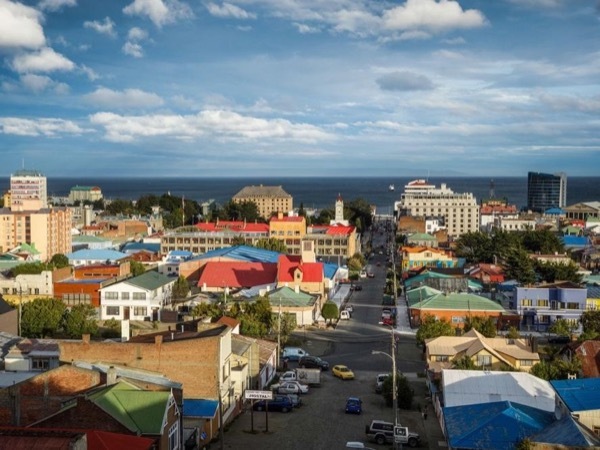 Our goal was to make you enjoy every minute touring around in Punta Arenas with us and felt safe and cared for. Hugs to both of you. Our tour in Punta Arenas had a last minute change in our guide (from Javier to Maritza). Maritza was very enjoyable and the van we toured in was very comfortable for our group of 4. Because of the late change there did seem to be some confusion on what sights we were to see but he did his best to accommodate and all went as best could be expected. TOUR GUIDE RESPONSE: The penguin colony was opened and closed several times during the season due to the decreasing number of penguins. It was 100% unforeseeable. We did offer a hike instead,so we drove 125 Kms. round trip to a new trail for hikers which is considered superb by the tourism Board in Chile. Now I know it is not that much. Anyway the customer is always right. Thank you very much to have traveled with us. Maritza, she is the best 5 out of 5. She took us to a few extras based on our interests and customized the tour to our hopes and desires. Thank you Maritza and I'll be sending you a few great photos! TOUR GUIDE RESPONSE: I was so happy to see you were enjoying nature so much as I do. Thank you very much for your interest in knowing about the place I love so much. Still the best birder I have had. We had originally planned to take an all-day tour with Maritza, but the penguins did not arrive at the Otway Sound this year, so she adjusted the plans and gave us three-hour city tour of Punta Arenas. We appreciated her knowledge and good spirits, particularly during our tour of the Braun cemetery.